Beyond Easy: Late August grab bag: Orion, Ramadan, poetry. 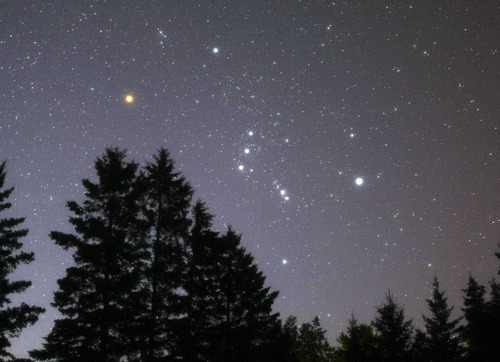 August 23, 2001, 4:00 a.m.: Orion can be seen low on the horizon, and all is right with the universe. The plump crescent Moon is higher in the sky, Ramadan will be over soon. I suspect James wished to challenge my assertion that Orion is a winter constellation -- which it is, although it first begins to appear on the horizon toward the beginning of September. He also probably spoke to our shared casual interest in Islam -- fostered in him by his political science background (coupled with the decades of American entanglement in Middle East) and in me by my dabbling in medieval Arabic literature and science; and in both of us by our mutual friend Nickie, a Muslim convert. Indeed it is Ramadan, though not for much longer. This seems as good a time as any to share a piece I copied from an issue of Poetry magazine a few years back. It got mixed up in all my papers, and unexpectedly turned up the other day while I was doing some housekeeping. So! In honor of Ramadan's conclusion (and so I can finally discard the crinkled and folded hard copy), here is a piece by Palestinian poet Mahmoud Darwin for your reading pleasure. From now on, your only guardian is your neglected future.